Chicory is a perennial plant that is commonly cultivated and also found wild in the U.S. and Europe. The rootstock is light yellow outside, white inside, and, like the rest of the plant, contains a bitter, milky juice. The stiff, angular, branching stem bears lanceolate leaves that are coarsely toothed near the bottom of the plant, but entire higher up. The light-Blue to Violet-Blue, axillary or terminal flowerheads feature rays that are toothed at the ends. Properties: Appetizer, Cholagogue, Digestive, Diuretic, Tonic. 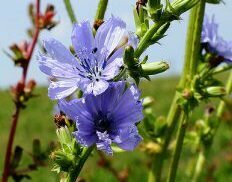 Chicory is often recommended for jaundice and for spleen problems. The juice of the leaves and a tea made from the flowering plant promote the production of bile, the release of gallstones, and the elimination of excessive internal mucus. They are also useful for Gastritis, lack of appetite, and digestive difficulties. A decoction of the rootstock is said to be beneficial to the glandular organs of the digestive system. For painful inflammations, try applying the boiled leaves and flowers wrapped in a cloth. Decoction: Use 1 teaspoon rootstock or herb per 1/2 cup of cold water; bring to a boil and strain. Take 1 to 1-1/2 cups a day, a mouthful at a time. Juice: Take 1 tablespoon in milk or water, three times a day. Chicory is also a wild food. Nutrients (Per 100 grams) Calories – 20 Niacin – 0.5 mg. Riboflavin – 0.10mg. Calcium – 86 mg. Phosphorus – 40 mg. Thiamin – 0.06 mg. Fat – 0.3 grams. Potassium – 420 mg. Vitamin A – 4.000 IU Iron – 0.9 mg. Protein – 1.8 grams. Vitamin C – 22 mg. Uses: Coffee, salad, cooked green. The roots make an excellent coffee substitute, (without the caffeine), when roasted in an oven until dark brown and brittle, ground, and prepared like coffee; use roughly 1-1/2 teaspoons chicory for each cup of water. The very young leaves can be eaten fresh in salads and the older, bitter leaves can be boiled in several waters and eaten.